Laserklinic Cosmetic Surgery offers Cavi Lipo with the finest Ultrashape and Liposonix lasers for the most effective treatment for non-surgical body contouring. 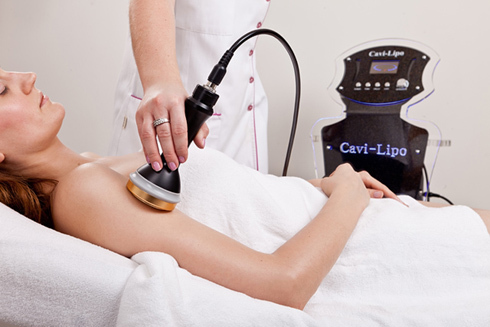 Cavi-Lipo works by emitting ultrasound waves that cause the formation of bubbles in the fat cells. These bubbles burst to make the fat molecule as small as possible to allow them to pass through the wall of the fat cell into the excretory system to be disposed of. The ultrasound waves that pass through the skins surface stimulate and oxygenate the surface of cells resulting in the tightening of the skin. At Laserklinic, Cavi-Lipo is a non-invasive procedure that utilizes ultrasound waves applied externally to stimulate the fat cell and release fat. Cavi-lipo is the only ultrasound device that is effective on cellulite. Patients undergo the procedure without use of anesthesia since no pain is present. Cavi-Lipo is effective in treating all body areas where there are localized fat deposits or cellulite present that are resistant to diet and exercise. Cavi-Lipo is a treatment plan that is ideal for patients who already maintain a healthy lifestyle yet wish to remove the localized pockets of fat to reduce a percentage of body fat. However, at Laserklinic we also offer Cavi-Lipo to patients who want to ‘jump start’ to a healthier lifestyle. This treatment provides means of motivation for our patients by assisting them in making better and healthier choices for themselves. Results vary from patient to patient since everyone’s body processes differently. Factors such as, difference in tissue structure, treatment area, age, metabolism, medications ad changes in hormones can affect one’s results. Dramatic first day losses of more than 3 inches to as little as ¼ inch may be evident. However, some patients may notice results within a week of undergoing treatment. In order to achieve lasting results, we highly recommend patients to maintain a healthy diet and encourage exercise.